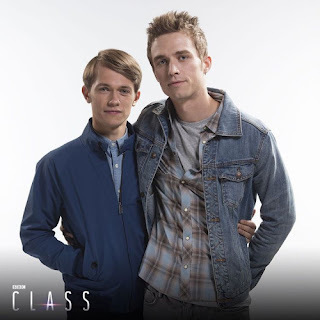 In the first episode, Charlie invites Polish fellow student Matteusz Andrezejewski (Jordan Renzo) to be his partner for the School Prom, prompting the new show’s first gay kiss as well as the comment “Oh yes my deeply religious parents are very happy I’m going to dance with a boy”. Class was broadcast in the wake of Britain’s 2016 referendum on membership of the European Union, where the country decided by 52% to 48% to leave the organisation. One reason was public dissatisfaction with the free movement of persons, a central pillar of the Union. In particular the accession of Eastern European countries to the Union in 2004 gave rise to an influx of Eastern European nationals into Britain, represented in Class by Matteusz. There are several points of interest here. The first is that Doctor Who and its spin-offs had up until Class almost ignored the Eastern European immigration, despite the show’s obsession with charting British national identity. This is probably because the show has had another story to tell: Britain’s transformation from Empire to multi-racial society. Secondly, now that Brexit – British exit from the EU – is happening, the Whoniverse seems more relaxed about making Eastern Europeans part of its national story. This is timely, as Poles have recently replaced Indians as Britain’s most numerous ethnic minority. Moreover the referendum result was followed by a deplorable upsurge in racist attacks against Eastern Europeans. In this light the thoroughly sympathetic image of Matteusz points the way forward for popular culture. But not all aspects of British identity are attractive. In terms of species Charlie is a Rhodian, a name strongly reminiscent of the British colony of Southern Rhodesia which spawned the apartheid-state of Rhodesia before it became Zimbabwe. The Rhodesia metaphor chimes with the Rhodians’ oppression of their rival species the Quill. It also confirms that the Whoniverse remains centrally animated by Britain's imperial story. Charlie’s ruthlessness makes Matteusz realise that the couple are not as similar as he thought, and prompts a short-lived split between the couple. It is fairly common for Doctor Who to portray the British as unduly callous - see for example. "Doctor Who and the Silurians" (1970), "The Christmas Invasion" (2005) and "The Beast Below" (2010). With Brexit in the offing, Matteusz’s Britishisation is on all fours with the trend towards Eastern Europeans living in Britain applying for British nationality. This is not to say that Matteusz lacks pride in being Polish – “never turn your back on an angry Pole” he quips on one occasion – but it shows once again how the Whoniverse projects as an attractive quality of Britishness its capacity to absorb into its fold ethnicities and nationalities which constantly enrich its very character.